For this correspondent, New South Wales’ long weekend means two things – football grand finals and a trip to the country for the Osborne Open. The Osborne Open started 10 or so years ago at a friend’s family’s property and revolves around a not so very serious tennis tournament. The property is long gone and we’ve taken the opportunity to venture into different parts of New South Wales to continue the tradition. For the second year in a row, 5 families descended upon Markdale for a long weekend of tennis, food and footy finals. Markdale is a farm that is 35km north west of Crookwell, which is roughly 3 hours south of Sydney. This year’s Aussie Rules Grand Final (GF) held special significance as my beloved Sydney Swans had made it through and anticipation was high as we huddled around a way too small TV set for what was expected to be 4 quarters of sheer tension and torture. Without going into detail, the farm’s television didn’t receive coverage from the TV station with the rights to the GF coverage. This realisation occurred at the start of the first quarter and after much cursing 5 of us jumped into a car to dash to Crookwell, where we could be sure the game would be shown. We listened to the game on the radio for the first quarter and Hawthorn had gotten the jump on the Swannies – and as we dashed into the Crookwell Hotel (imaginative name), we held grave fears. As predicted, however the game swung back and forth – there were 6 lead changes – and the final result was in doubt until Nick Malceski snapped a goal with about 90 seconds. The beauty of watching a game in a pub is being able to carry on like a lunatic and drink draught beer. 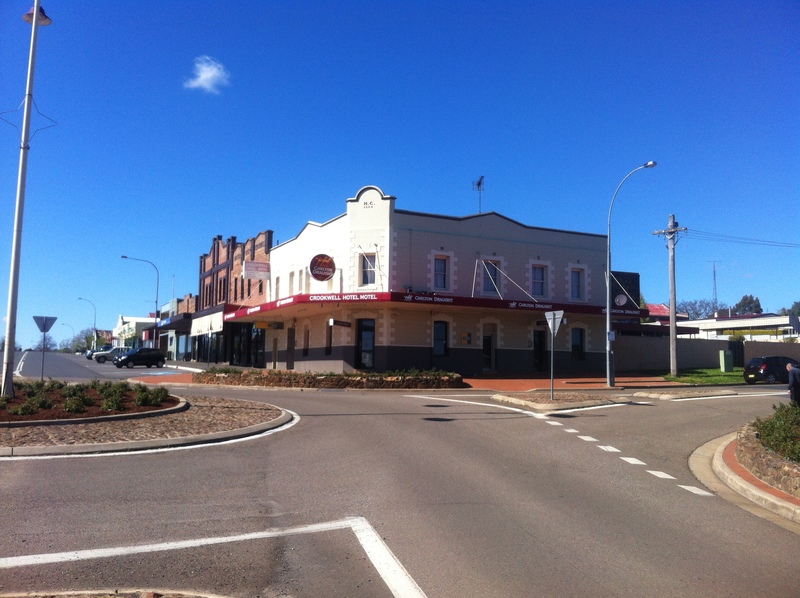 Crookwell’s not really an AFL town and many patrons steadfastly stared at the screens showing the races and occasionally cries of “Carn you Swannies” competed for airtime “Go 6, Go 6, yes 6 – yew bewdy”. It wasn’t as good as being there as a couple of BotF correspondents were – but a terrific experience nonetheless – and the Swans were truly heroic. Richard Hinds summed it up best. 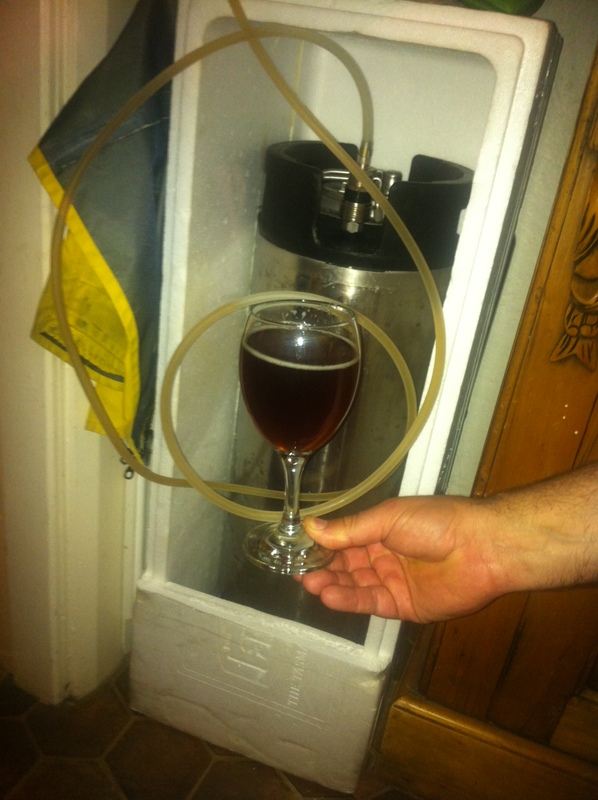 A wonderful thing about farm weekends is that the fresh air definitely puts an edge on one’s thirst – and fortunately this year one of the lads brought up a keg (no less)of home brew named Cockburn British Bitter. Beautiful ruby brown and an even better taste – very smooth, eminently drinkable and a nice hoppy finish. The boys got well and truly stuck in and celebrated the Swannies win in style. I always try and take up at least one new beer – partly for the beerporn and partly to share something new with the lads. 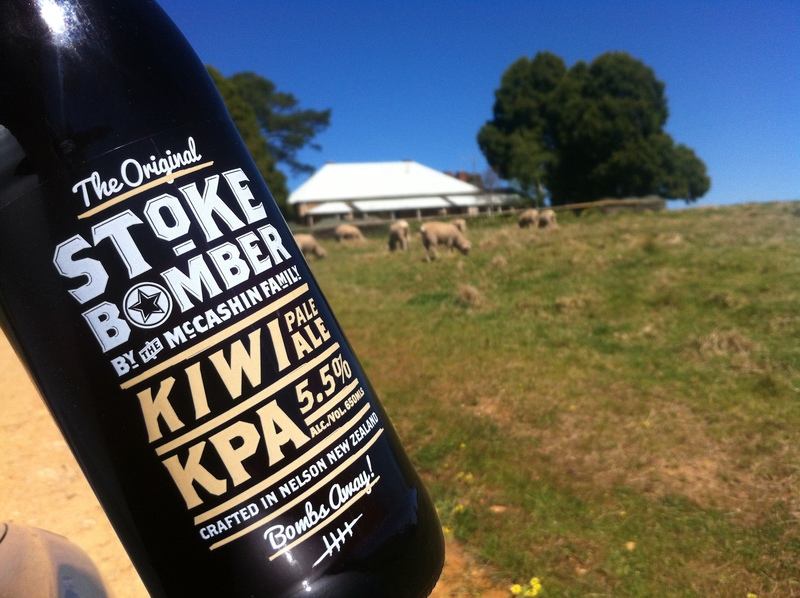 Now, as you look at the beerporn and look at the home of the new beer, you might think I’m taking the mickey – but the farm we were on was a fair dinkum sheep farm. There were literally thousands of them roaming the place. 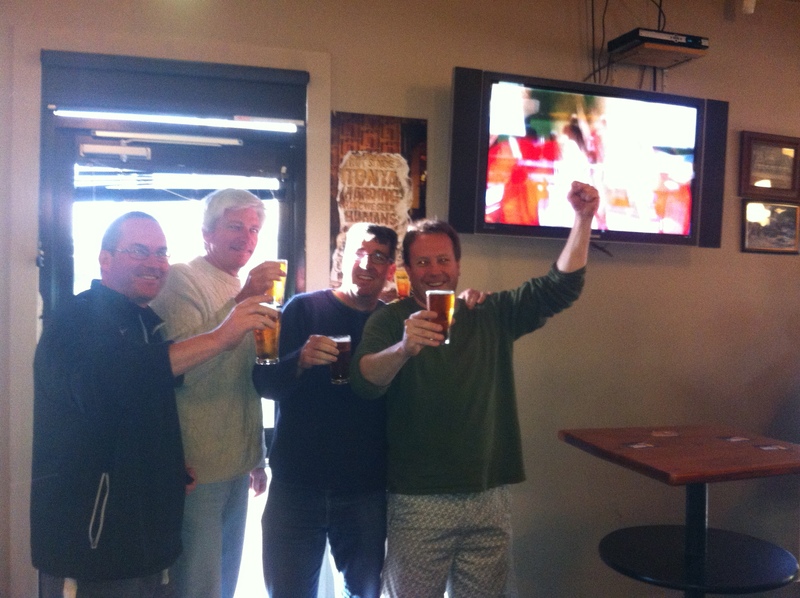 We’ve written about the McCashin family before and how they’ve taken back over their brewery. 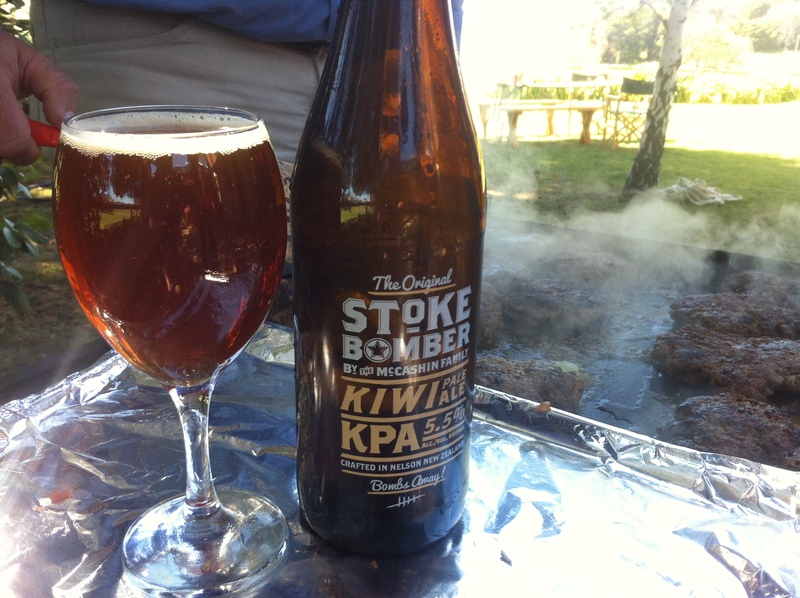 Stoke Bomber – a Kiwi Pale Ale – is their latest offering and it is a bloody ripper. This is a beer in the style of an American Pale Ale as opposed to an IPA. Wonderful amber colour and a fabulously bright, hoppy bite. What makes it a genuinely Kiwi Pale Ale is the use of a relatively new hop variety from New Zealand called Wai-iti. You’ve got to love the 650ml bottle as well. I haven’t seen any of the Stoke beers on tap – I’d love to have this on tap on a sun drenched deck. Thanks Patrick. This review means a lot to the humble home brewer. Cheers!